This Keto Coffee Cake is what low-carb breakfast dreams are made of! Made with wholesome ingredients, you can happily enjoy a slice alongside your morning coffee without being thrown out of ketosis! Coffee cake has always been my favorite bakery item to order when grabbing a coffee and quick breakfast at a cafe. The pairing between the bitterness of coffee with the sweetness of cinnamon in coffee cake is the ultimate combination! 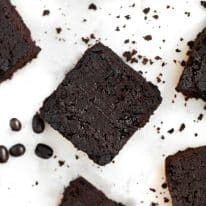 This Keto Coffee Cake has all of the flavors of the traditional coffee shop variety without the high carbohydrate content and refined sugar. 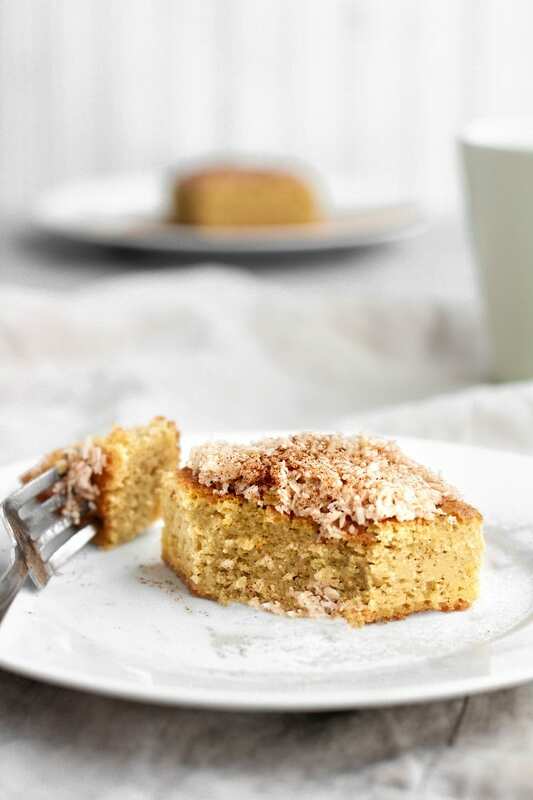 This Keto Coffee Cake, like that of virtually all of my dessert and fat bomb recipes, is sweetened with classic monk fruit sweetener, a natural and net-carb-free sweetener. 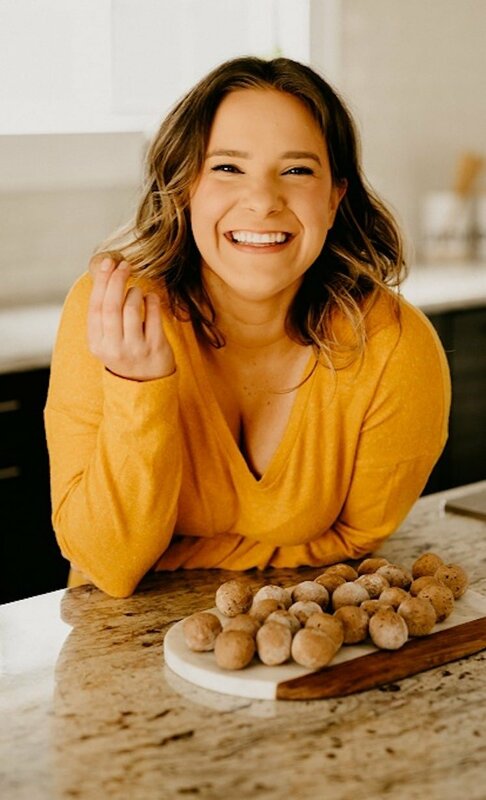 I personally use Lakanto Monk Fruit Sweetener as I find it has the best taste, incorporates perfectly into recipes, and doesn’t leave an odd aftertaste like that of other keto-friendly sweeteners. If you’ve never tried monk fruit sweetener, I highly suggest it! You can use code “REALBALANCED” for 20% off your Lakanto order! If you are looking for more keto recipes that are sweetened with monk fruit sweetener, make sure to check out these 40+ Keto Monk Fruit-Sweetened Recipes! 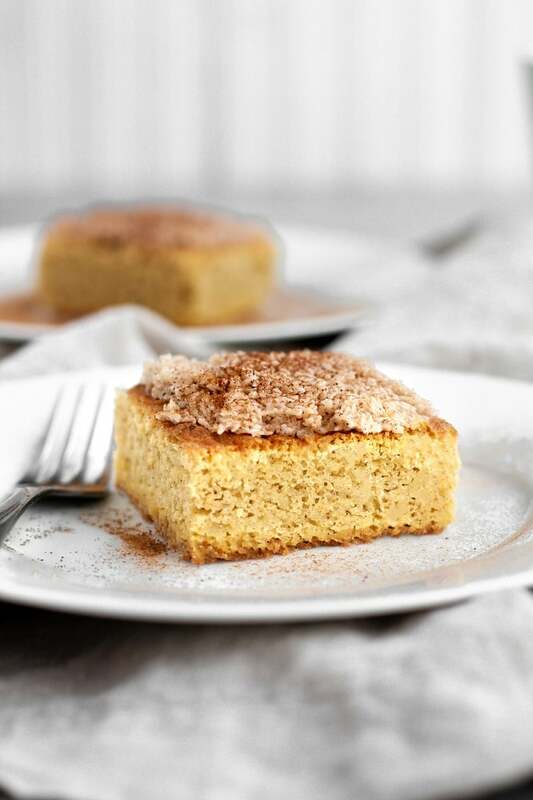 This coffee cake is made with coconut flour rather than almond flour, which many keto and paleo baked goods contain, making this recipe entirely nut-free and a great option for those with a nut allergy to enjoy. This Keto Coffee Cake is a great keto-friendly, paleo-compliant, and nut-free breakfast recipe to hand on-hand! Keto and Low-Carb: One slice of this Keto Coffee Cake contains only 1.7 grams of net carbs per serving. Nut-Free: This recipe uses coconut flour, making this coffee cake a perfect option for those who have a nut allergy or nut intolerance. Paleo: This recipe is paleo-compliant as it does not contain gluten, grains, soy, or dairy. Dairy-Free: This recipe is made with coconut oil making this coffee cake entirely dairy-free. 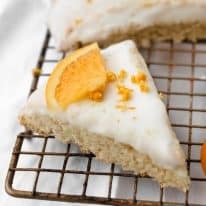 Refined-Sugar-Free: Sweetened with classic monk fruit sweetener, this coffee cake is refined-sugar-free. One slice of coffee cake contains 1.7 grams of net carbs per serving. One pan of coffee cake yields approximately 12 slices. 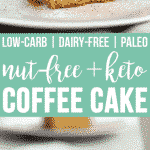 This Keto Coffee Cake is keto, low-carb, nut-free, paleo, dairy-free, gluten-free, grain-free, vegetarian, and refined-sugar-free. Looking for more nut-free ketogenic recipes? 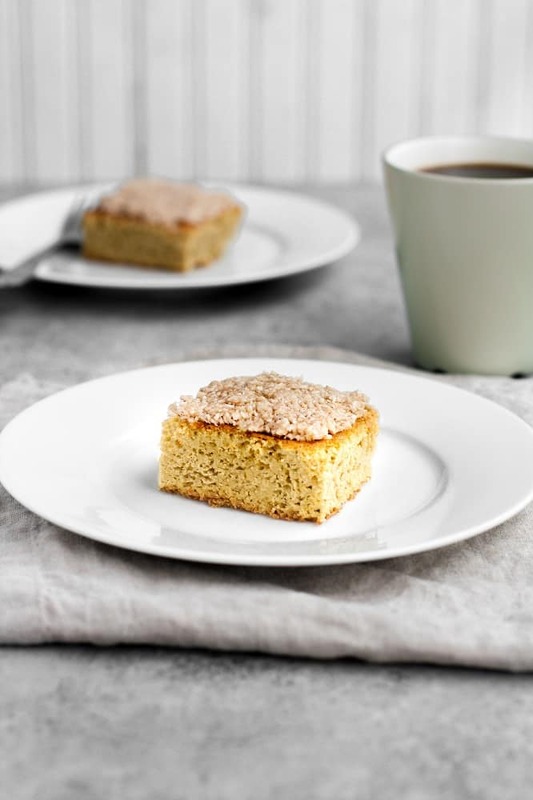 This Keto Coffee Cake is a delicious low-carb and nut-free breakfast option to enjoy alongside your morning cup of coffee! 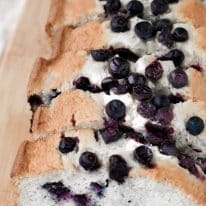 This recipe is keto, low-carb, nut-free, paleo, dairy-free, gluten-free, grain-free, vegetarian, refined-sugar-free, and contains only 1.7 grams of net carbs per serving! Preheat oven to 350 degrees and grease 9×9 baking pan (* see note below). To a mixing bowl, add eggs and, using an electric mixer, mix on high for 2 minutes. Add coconut oil and vanilla extract and mix on high until well-incorporated with eggs. To a separate bowl, add dry ingredients and whisk together. With electric mixer turned to low, slowly add dry ingredients to wet ingredients and mix until fully incorporated and dough is formed. Pour dough into prepared pan and bake for 35 minutes. Meanwhile, to a mixing bowl, add all crumble ingredients and mix together with spoon or electric mixer. Remove pan of coffee cake from oven and allow to cool completely before topping with crumble and cutting into slices. Does it taste eggy? 9 eggs! I would try it though but I don’t see coffee listed anywhere in the ingredients?! Hey, Lara! No, it doesn’t taste eggy. The purpose of the eggs is to act as a “glue” to hold all of the ingredients together. As for coffee not being an ingredient, coffee is actually not in coffee cake. It’s a dessert meant to compliment a cup of coffee. Of course! You can absolutely add some espresso powder do the recipe, which will give it a coffee flavor! I’d suggest doing like 1-2 tsp espresso powder. 🙂 And, you can sub in Truvia here at a 1:1 ratio for monk fruit sweetener. Enjoy, Lara! When I subtracted the fiber from the total carbs I get 1.7 carbs. It says it is 3.5 in the beginning of the recipe. I think it would work in a bundt pan! I don’t think you’d need to double it, depending on the size of the bundt pan you use, of course! If it’s a large pan, then yes, I would perhaps double it; if you do that, though, note that baking time will likely need to be increased. 9 eggs? I wanna make this but can u use flax eggs or a egg sub? Hi there! I haven’t personally tried that substitution but, I think if I had to guess, the recipe would work, but I think using flax eggs may overpower the flavor of the cake. I’d suggest taking a look at all of my egg-free recipes here. ? What size casserole dish are we to use? I used a loaf pan and it had to cook for 55 minutes. Did you use aq 8×8 or ?? It turned out very good, however the icing was grainny (but good) I would like to make this again, but with the proper pan. Hi, Cathy! Thanks for your comment! Yes, this should be baked in an 8×8 baking pan. I updated the recipe card to reflect that! Wish I’d known to use a large casserole pan , instead of a brownie size pan. Cake didn’t bake , and rose Wayne too high. If I don’t put it in a larger pan , it would have worked. Also, the cumble came out soupy, too much coconut oil. Wish I’d slowly added the oil, the name I would have known and stopped at two table spoons. So I had to put the crumble into a bread pan and cook it separately to make it solid. Tastes great, though. I will try it again with fixes. Thank you for that feedback, Jessica! I’m glad you enjoyed the taste! It’s one of my favorite recipes!!! Easily my new favorite breakfast (dessert?) in the house! Breakfast dessert! The best meal of the day! 🙂 Thank you!! !